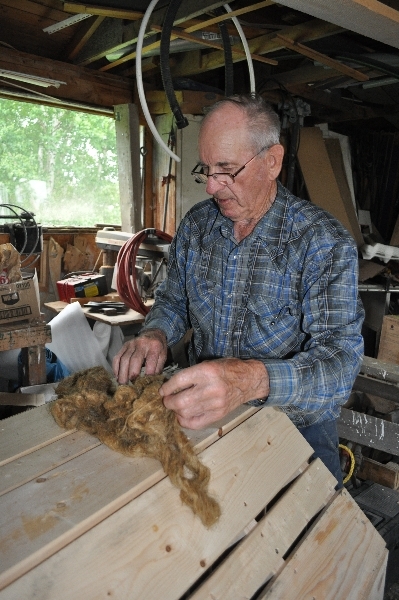 Tom Abbott moved to the Glovertown area with his wife in the early 1960s. Here he worked building longliners at Max Burry’s shipyard and then spent 41 years in the carpentry shop at Terra Nova National Park. Tom estimates he’s built 50 or 60 boats, everything from rodneys to longliners. 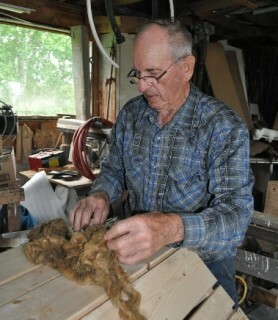 Unlike other boatbuilders in Glovertown, Tom does not used steamed laths for his frame, preferring cut timber instead. Lathed boats “give and take too much.” Timber boats, Tom says, are heavier and would be less impacted by winds than a lighter boat. 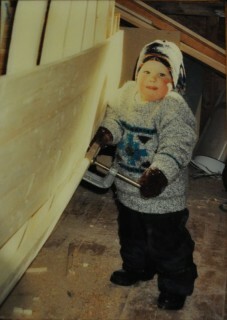 Tom’s grandson, Curtis has carried on his grandfather’s passion for boat building. Born in 1994, Curtis has been helping Tom build boats for as long as he can remember. “I guess there was never a time when I decided I wanted to learn it, I just grew up around it,” says Curtis. Curtis has now built five speed boats with his grandfather. While he is confident he can build one on his own, Tom is always eager to help.“It’s nice when you can work together,” Tom says. And Curtis agrees, noting that he would not likely have an interest in boat building if it wasn’t for his grandfather.